This Mother’s Day weekend, we pause to appreciate the maternal people in our lives for all the things they’ve taught us, and do for us. What better time to appreciate the many things that SDOT’s flower-filled roadside landscapes do for us throughout the year? We all enjoy the beauty of the spring daffodils and other flowers as we cruise along our streets. But flowers are more than just a pretty face – they serve crucial functions in an urban environment. Flowers and well maintained streets help make a city more walkable and bikable, which in turn make it more attractive. 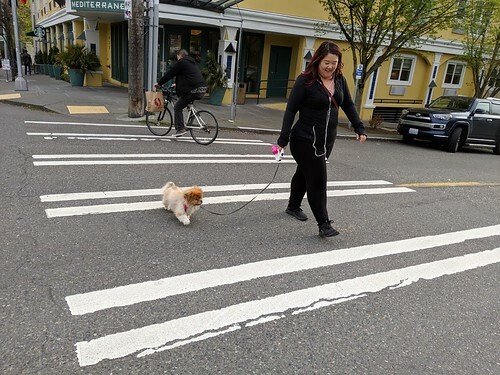 More people on our streets make Seattle safer and reduce crime. Also, flowers are a critical piece of the urban ecosystem because they support pollinators, the creatures such as bees, butterflies and hummingbirds which pollinate plants so they can reproduce. 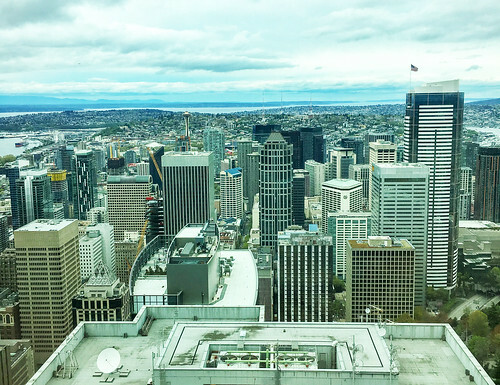 The decline of pollinators is a worldwide crisis, and SDOT is paying attention to what steps it can take to help address this problem. Two years ago, Seattle became one of the first cities to join the Bee City USA network by increasing habitat for pollinators on City property and encouraging residents to plant more flowers on their property. 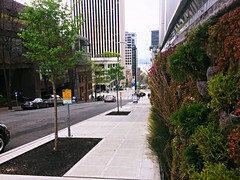 Now, when we plant flowers in our street medians, curb bulbs, traffic circles and other locations, SDOT considers which flowers will better support pollinators. A diverse mix of species which blooms from spring through fall provides more variety for different types of pollinators. Not only are wildflowers beautiful, but they need less maintenance than formal flower beds. I bet your mother could have taught you that. To learn more about how SDOT gardeners and irrigation specialists take care of all types of plants at over 200 locations along our 4,000 miles of roadways, check out this previous post. 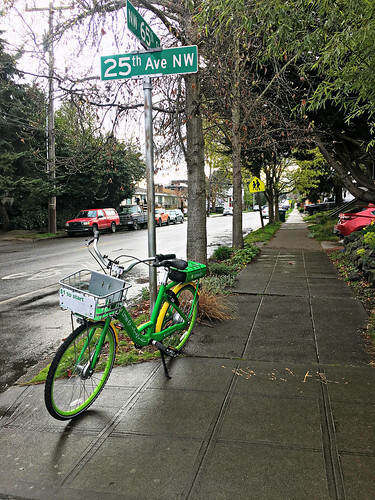 For Earth Day on Saturday, let’s look at how our city crews care for the 40,000 trees along our streets which SDOT is responsible to maintain. 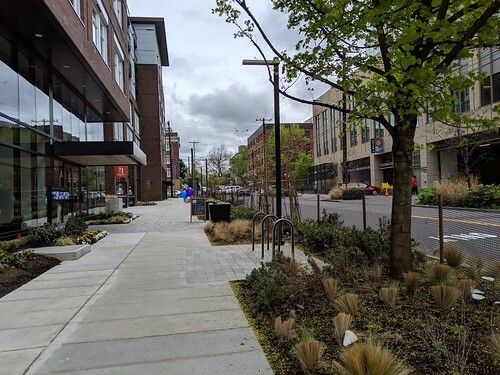 It’s a big job, so last year SDOT launched the Street Tree Management Plan (STMP) to be more proactive and to manage our trees in a more holistic way. An important part of the plan’s data collection is our for people to take our community survey – which would be a great way to help you observe Earth Day! The goal of the STMP is to improve the health and resilience of our street trees by collecting more complete data about them and then using that info to make better decisions about our work. The plan divides the City into 27 sectors called “management units.” We focus the work of the STMP on 3 units per year so that by 2024, all units will be proactively served. Inventory all street trees by the end of 2024 to better prepare for emergencies related to street trees and plan an improved future for them in all Seattle communities. 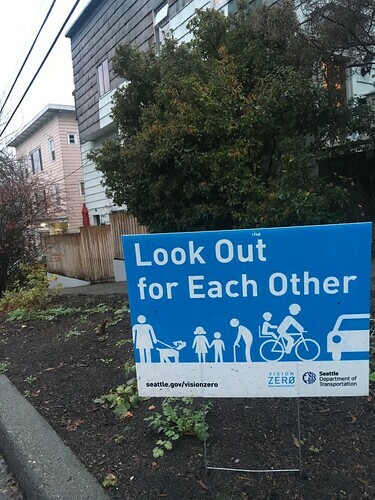 Maintain every SDOT-maintained street tree (as needed). 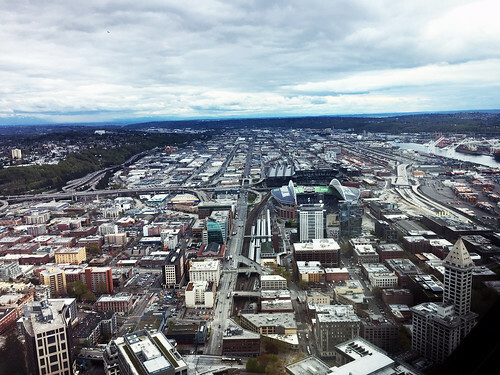 By the end of 2024, through scheduled pruning, maintenance, hazardous tree removal, and planting, SDOT will increase the health of our trees and improve safety for people. Replace trees 2 for 1. 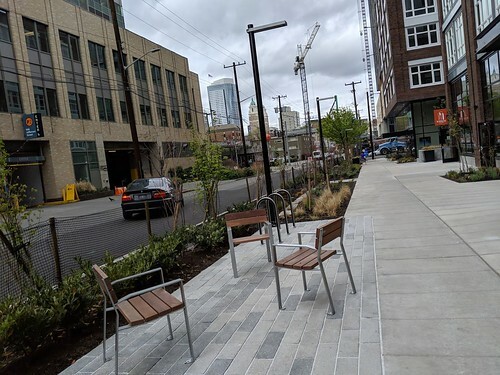 The City replaces each street tree that is removed with two new ones, planting the most suitable trees to ensure a diverse, resilient urban street canopy. Connect with the community. 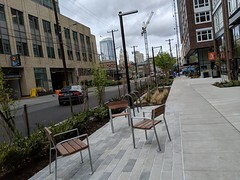 We want everyone to receive the benefits of streets trees equitably, so we started a plan to connect with all Seattle communities. We are also conducting an equity analysis of the STMP as we develop it to help ensure that we are creating the plan with all communities, especially those who have been underserved in the past. The Street Tree Management Plan is already bearing fruit (pun intended). In 2016, we completed the first three management units. In the South Park/Highland Park management unit, the data on street trees was updated and improved so much that SDOT’s estimate of the value of the street trees in this area tripled from about $120,000 to over $360,000! We also increased our knowledge of the types of trees in this management unit, which helps us identify which trees to plant to increase the diversity and resilience of “street tree forest” in South Park and Highland Park. Seattle wouldn’t be the Emerald City without all the beautiful trees that line our streets. Street trees provide shade and habitat, soften busy urban sidewalks, simply make our streets nicer places to spend time, and so much more. So, who maintains the 40,000 “SDOT trees” spread along Seattle’s 1,675 linear miles of streets? SDOT’s team of nine arborists and a supervisor do this. 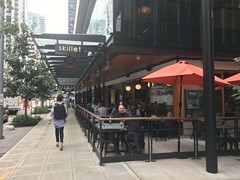 Seattle has about 250,000 street trees (all trees growing within public places are considered to be street trees; excluding trees in private yards, parks, etc.) that’s about a quarter of a million trees that need to be maintained. 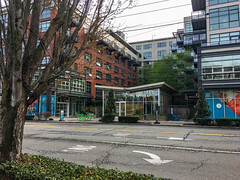 Adjacent property owners are responsible for maintaining most of these street trees (when a street tree is planted, the property owner and the city agree who will maintain it), and SDOT maintains about 40,000 of them. 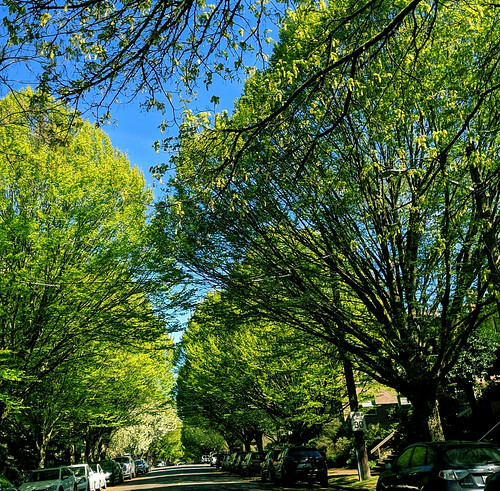 Keep in mind that “SDOT trees” are more likely to be planted along busy arterials than on quiet neighborhood streets, so our arborists often work in very challenging environments. Removing trees after a landslide on Highland Park Way SW.
SDOT arborists keep our street trees healthy, attractive, safe, and valuable. They prune about 5,000 trees per year so they’re not blocking people walking on sidewalks or vehicles driving down the street. They also deal with safety issues of street trees such as by assessing and removing the unstable ones. Our team of arborists has special training so they can scale tall trees by climbing (sometimes more than 100 feet high) or by using aerial lifts and other heavy equipment. 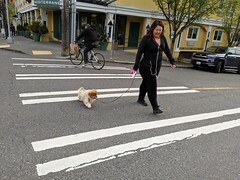 They also use traffic control skills on our busy streets and coordinate with agencies whose electric lines and trolley wires intermingle with tree branches. Most of the team are ISA Certified Arborists and hold Tree Risk Assessor qualifications. And of course, safety is always a top priority for the team. SDOT arborists also provide emergency response 24/7 after a storm, car crash or a landslide, where they remove fallen or unstable trees, or branches from the scene. Re-opening roads blocked by snow storm damage. Check out our previous blog post video highlighting SDOT’s Maintenance Operations and Urban Forestry crews assisting the City of Portland during their Winter storm. SDOT Crews clearing Portland streets of fallen trees during their Winter Snow storm in January, ’17. 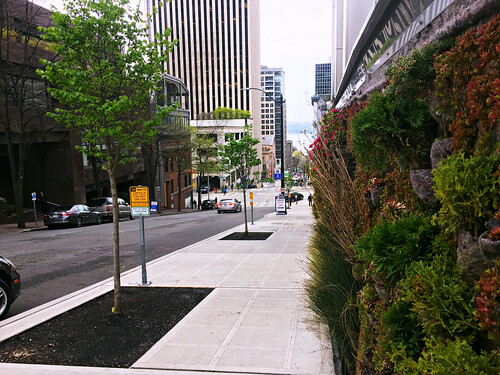 Learn about how SDOT gardeners and irrigation specialists maintain the many plants along our streets in this earlier blog story. SDOT engineers, planners, and paving crews are responsible for the 4,000 miles of roadway and 2,000 miles of sidewalk that keep our city moving. But who maintains the countless plants that keep our city green? That’s SDOT’s gardeners and irrigation specialists. A crew member works on a green median to keep the City welcoming and green. 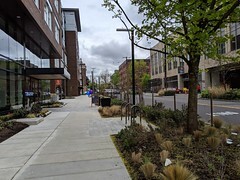 Our team of gardeners, irrigation specialists, certified horticulturalists and arborists help create a more pleasant, welcoming, and positive environment for everyone walking, biking, busing, or driving in our city. The crew works on a planter box. Every crew member is licensed by the WA Department of Agriculture and trained on principles of integrated pest management to minimize our use of pesticides. Additionally, everyone is trained in flagging and traffic diversion, and some are certified traffic control supervisors. Together, they help keep our shrubs, turf, ornamental grass, perennials, annuals, and other plants healthy, happy, and looking good with more than 150 different irrigation systems. City gardeners are responsible for the city’s plants and small trees. 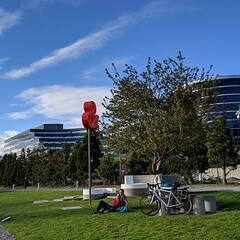 With more than 120 acres of green spaces across over 200 locations, including new additions like Mercer Ave median in South Lake Union or the entrances to the future waterfront tunnel, our gardeners and irrigation specialists work hard to make sure we stay the Emerald City. 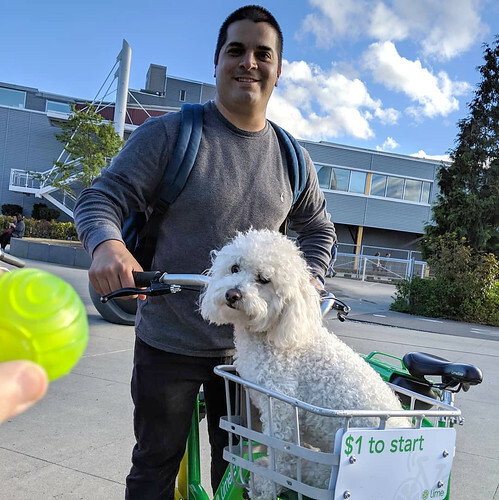 Last week we were excited to welcome Nikola Agatic, who rode into town after completing a cross-county bicycle trip with stops for tree planting along the way. We joined community members to help him plant a tree in Railroad Park, which for trivia buffs was planted by producers from Sleepless in Seattle as a thank you to the Westlake neighborhood after filming. 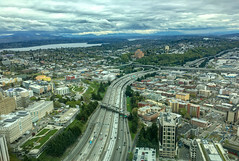 Seattle was the perfect place to the end trek, as an Arbor Day Tree City USA for 30 years and one of the best cities in the country for biking. Thanks for the tree Nikola! If you want to get a tree of your own to help keep our city green, Seattle’s Trees for Neighborhoods program is giving them this October and November. Enter the lottery drawing between July 18 and August 8, and you could win a FREE tree for your home or neighborhood. We love our trees in the Pacific Northwest, especially in Seattle. 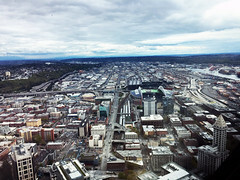 They add a pop of green in a city sometimes surrounded by gray. Besides being nice to look at, trees also filter carbon dioxide out of the air and produce oxygen. We can all agree that trees are valuable. 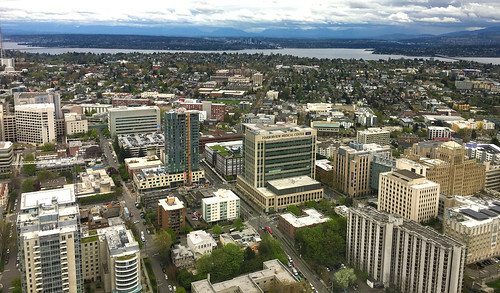 Using i-Tree, a program developed by the USDA Forest Service, SDOT’s Urban Forestry division is updating the dollar amount environmental benefits that our estimated 40,000 city maintained trees in the right-of-way provide. We will also be including the benefit calculations for privately maintained right-of-way trees, as they are added to our inventory when we update tree counts. For example, our forestry crews recently updated our tree inventory in South Park at the beginning of 2016. Using the i-Tree software, annual net environmental benefits calculated before the inventory were at $48,230. After the inventory, they were calculated at $83,763. The larger post-inventory value is the result of several factors: an accurate tree count that increased by over 350 trees, updated species documentation and the benefits they provide, and tree size updates to track environmental inputs and outputs. Over the next several years, this type of inventory analysis is going to be taking place across the entire city. 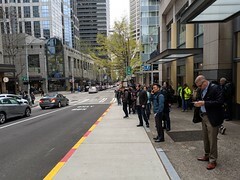 And thanks to Seattle voters who approved the 9-year Levy to Move Seattle in the fall of 2015, SDOT was able to add a third tree crew to help maintain our City’s street trees and respond to customer service requests. We will also be planting two trees for every one tree removed. Our gardeners expect to plant about 300 trees this year, mostly in the fall. We’ll be sure to check back in with them in a few months for an update. If you want to get a tree of your own to help keep our city green, Seattle’s Trees for Neighborhoods program is giving them this October and November. Enter the lottery drawing between July 18 and August 8, and you could win a FREE tree for your home or neighborhood.